We have been asked to open early for those who wish to have more time for quiet research, so the Committee Room will open at 1.30p.m. A huge amount of information is available on the history of Rosedale and Hartoft covering local industrial and social history most of which is in printed form. Computer research facilities available, and items for our archive can be scanned and copied. An informal afternoon where everyone is most welcome. Tea and home-baked cakes optional! If you are coming with some specific research in mind, please contact us beforehand by email. 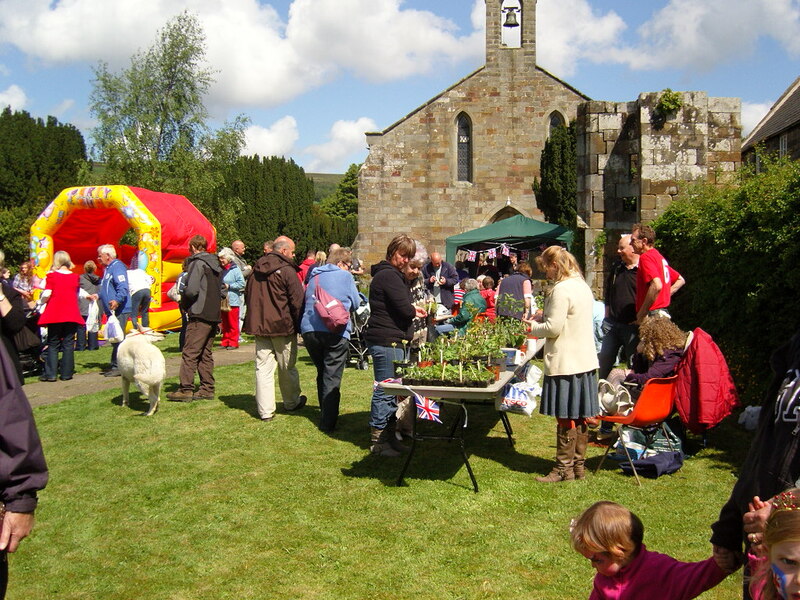 Rosedale Heritage Weekend which will be held in Rosedale Abbey village and will display new material as well as other archive documents and photographs. Lots to look at and a Family Treasure Hunt with prizes! 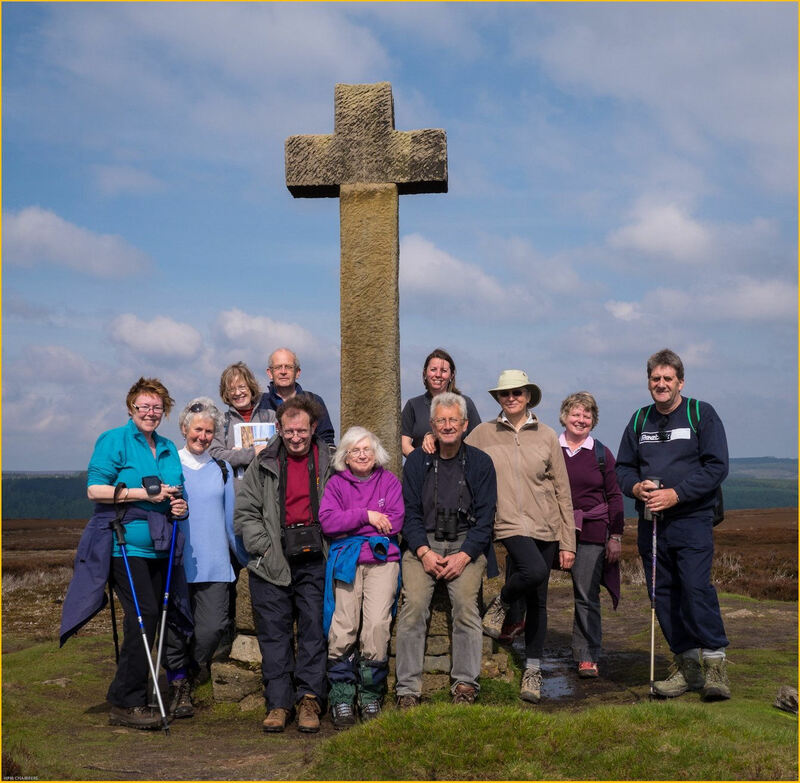 And a guided history walk (see Rosedale Walking Festival below). Plenty of refreshments are available all day at our excellent tea rooms and pub close by the village green, so come for the day and explore our lovely dale and discover more of its fascinating history. 18th AUGUST – ROSEDALE SHOW. Our popular marquee will be welcoming old and new visitors. Call in and have a chat or just take a look at our displays. WE ARE MOST GRATEFUL TO all our contributors who keep surprising us with more material. Please note that we love hearing from people but because of time constraints, we cannot give full histories of families, places or events on request. We will always try and answer specific questions and anyone is free to use our extensive archive by a pre-arranged visit or by attending our monthly meetings. Please bear in mind that with the huge influx of miners and allied tradesmen in the 19thC, it is often difficult to find specific information on such men and their families, apart from that available in Census returns and on Parish Registers. We are, however, always happy to hear from those doing their family history research. We have a large archive which is still expanding, covering the last 850 years of local history. NEW – A ROSEDALE ILLUSTRATED MAP We commissioned a local artist who has produced a painting showing, in a light-hearted way, some of the sites and events which are well-known and important in our community. Please go to the CONTACTS & LINKS page for further details of available prints for sale. The original artwork is now on display at the Coach House Inn, Rosedale Abbey. LAND of IRON – six years ago we joined North York Moors National Park Authority in their bid to get HERITAGE LOTTERY FUNDING for an area which includes Rosedale and is primarily a project aimed at preserving the industrial and natural heritage of the North York Moors and Esk Valley and covering an area of approximately 200 sq. kms. This is a huge, long-term project lasting several years and enormously important to our area. Our bid for over £3 million pounds has been successful and with match funding and other contributions, the figure has reached £3.8 million. Work has already started with the re-instating of the path of the track way to East Mines Stone Kilns. Work further along the old railway track clearing culverts and a massive drainage blockage at Reeking Gill continues around the dale in various locations in order to protect and conserve our unique and nationally important ironstone mining sites. Rosedale has three representatives on two committees dealing with the bid and we have been working hard with others in the Moors area attending meetings and working on detail. There is still a lot of hard work to do, to enable more work to be carried out at East Mines and Bank Top calcining kilns to conserve and protect the site and give better information for visitors. Other smaller projects are also planned and these should lead to better visitor information throughout the dale, development of natural ecology and community-based practical projects. Volunteer participation will be needed and a volunteer co-ordination officer is now in post. More details available through the NYMNPA website TELI pages. Anyone in the locality who wishes to join us will be most welcome. Roll of Honour (140 names). relating to each man who served. WWI Project 2017 – following our work beginning in 2014, with the help of one of our newest members we are putting together a fairly comprehensive file on the men who served in the War. Two of us visited the Somme and Ypres battlefields where we were able to visit the graves and commemorative sites of some of Rosedale’s fallen – a very moving and sad experience. An attempt to draw together the scattered references to mills (maybe five or six) which once operated in the dale. 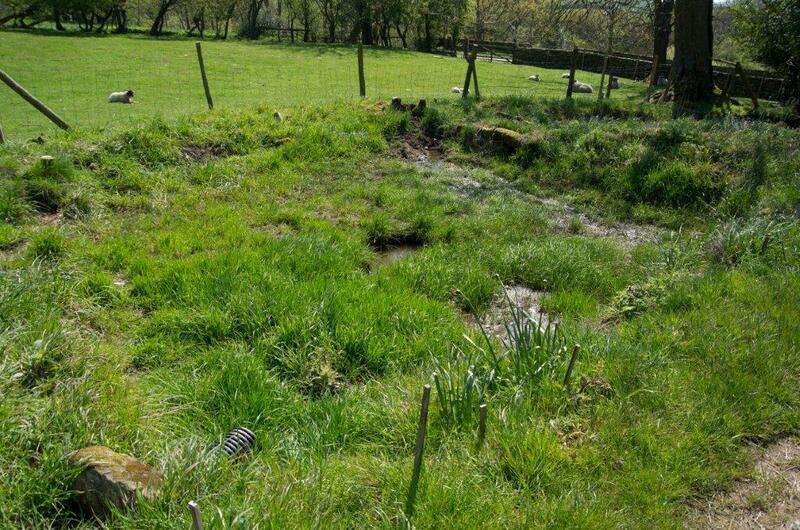 We are also looking at millraces, ponds and other water features and hoping to pinpoint as many sites as possible. If anyone can help us, please get in touch. This project is ongoing and we hope to finish and write up our findings this year. 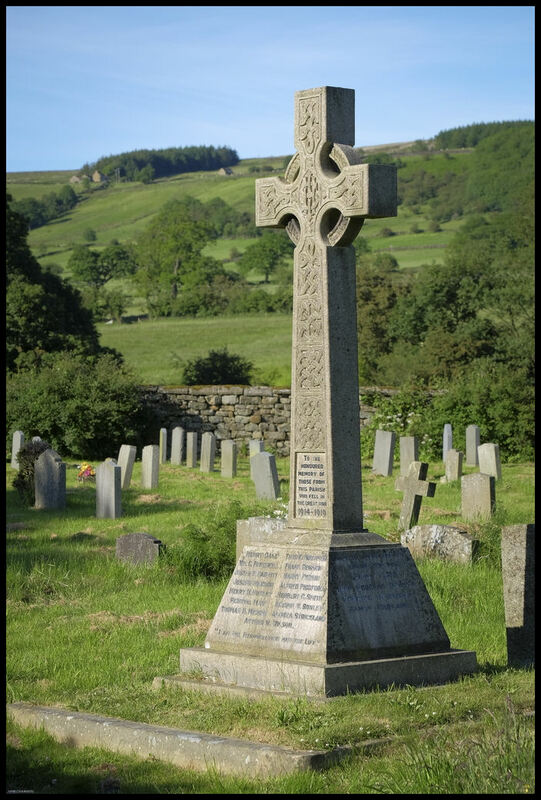 22nd& 23rd APRIL , 11.00 – 4.30 p.m.
Rosedale History Society, in association with “The Land of Iron” HLF funded project currently underway here in Rosedale and in the Esk Valley, is holding an exhibition of archive material including photographs, maps and plans, artefacts and much more. 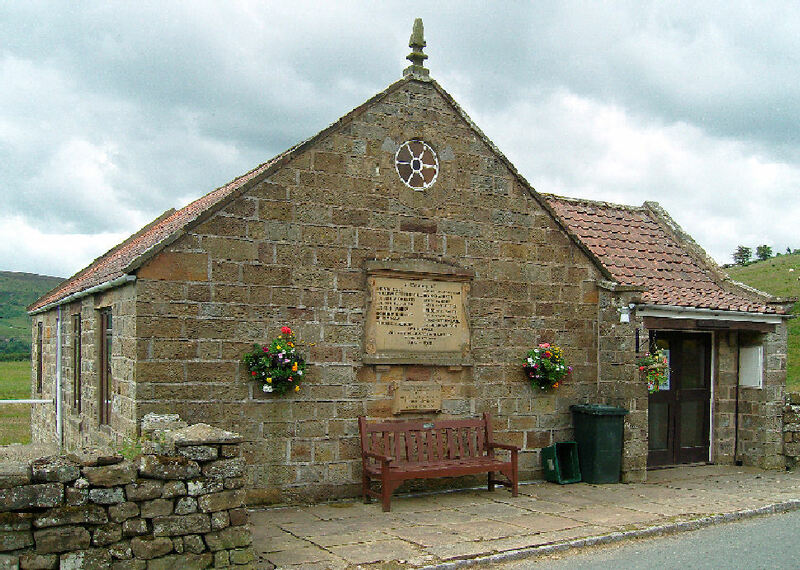 There will be plenty to see for the industrial history enthusiasts, including loaned items from Ryedale Folk Museum, and not forgetting the stories of wives and children of the miners and railwaymen, and Rosedale’s own social history. There will be some hands-on activities for children, information on local wildlife and the opportunity to find out more about the “Land of Iron” project with information for project volunteers. If you feel like being involved in archaeology, surveys and a bit of clearing and digging, here’s your chance! Scarborough artist , Andrew Cheetham, will be displaying work he produced while Artist in Residence here in Rosedale in 2010. Also, the Rosedale Art & Craft Group will showcase their high quality art and craft mixed media work, some available to buy. WALKS: on both days there will be a guided walk to the mine sites of Rosedale East. These are free for both adults and children (aged 11 and over) starting from the Reading Room at 2.00 returning approximately 4.30p.m. Please bring walking boots and bottled water. Well behaved dogs on leads are welcome. TALK: Malcolm Bisby, our very popular local mines and railway expert will give a talk with slides at Rosedale Abbey Church at 6.00p.m. on SATURDAY 22nd. Free entry with a collection for donations to the Church Roof Appeal. All are most welcome to these events and we look forward to welcoming you over the weekend. 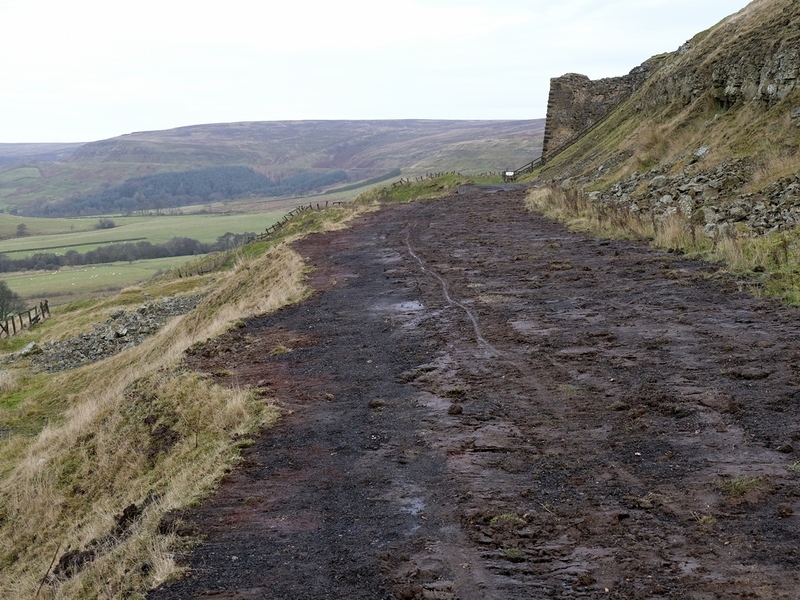 A year of slow and steady progress with visits from several people researching their Rosedale connections; ongoing work on our several projects, most importantly the HLF project where decisions were made over several months on the work to be carried out in Rosedale, particularly on the kiln sites. The work is now ongoing. We received a visit from a contributor from Texas and from Professor William van Vugt of Calvin College, Grand Rapids, Michigan – who is researching a book on the emigration of dales people during the 19thC. We were pleased to have been able to help. We have also received some excellent documentary and photographic material via an internet enquiry – it just keeps on coming in! WEEKEND LOCAL HISTORY EXHIBITION ON 13th AND 14th SEPTEMBER at Updale Reading Room. Featuring material from a project on World War One linking this terrible event with the communities in our local towns and villages at the time. We were joined by fellow members of the newly formed RYEDALE VILLAGES HERITAGE GROUP. (Lockton & Levisham, Thornton Dale, Appleton le Moors and Sinnington). 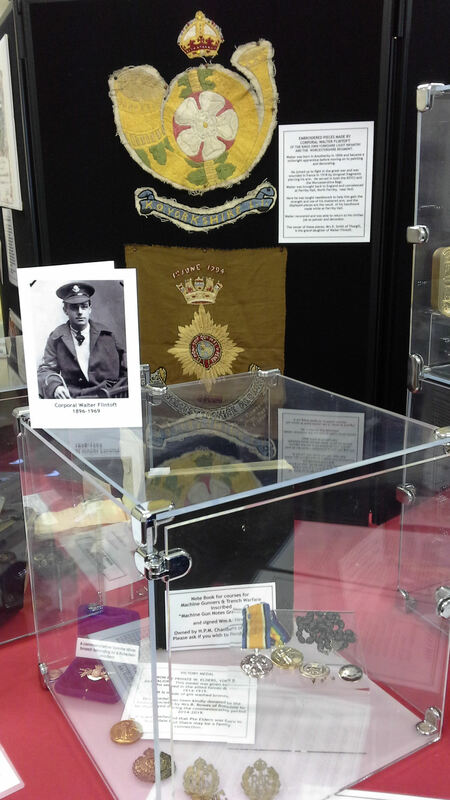 It included photographic displays, artefacts and a Commemoration of the men who served in the Great War, including those who did not return. We had an excellent response from visitors and local residents who were fascinated by the detail relating to some of the incidents and stories we recorded. A very good raffle and superb homemade cakes all helped make the two days a great success. Thank you to all who attended and helped. 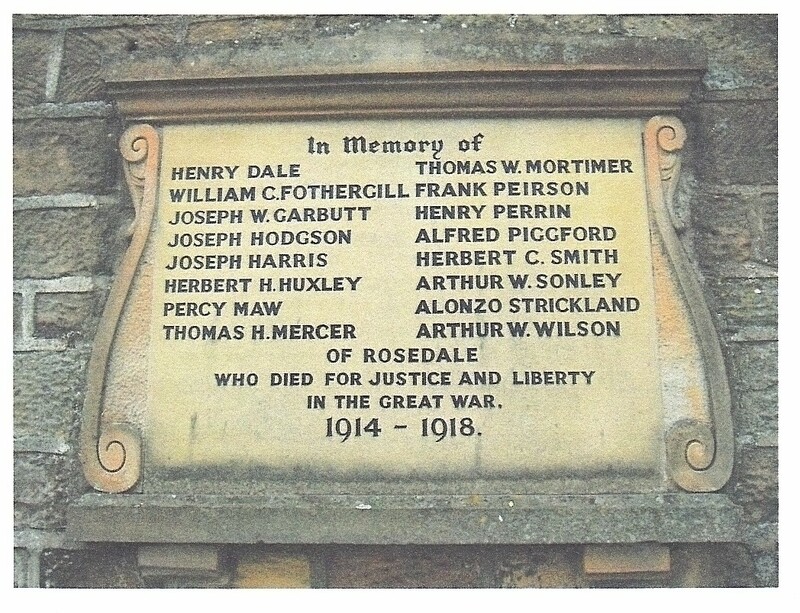 We are collecting as much information on well over 100 names from Rosedale and Hartoft and if you have anything we can add, please do get in touch as soon as possible. 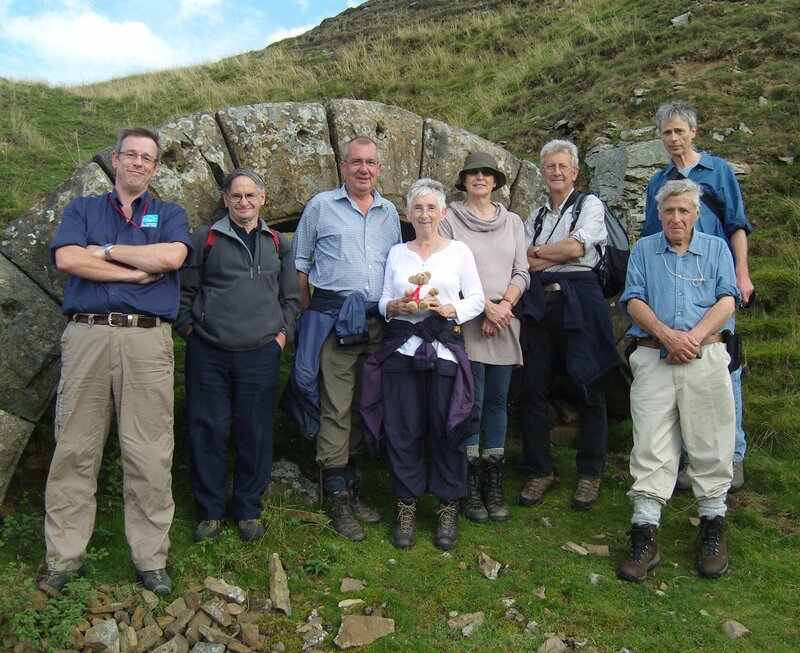 Report on ROSEDALE’S WALKERS ARE WELCOME WALKING FESTIVAL which took place on 14th and 15th JUNE. A PROGRAMME OF THEMED WALKS GIVEN BY MEMBERS OF OUR COMMUNITY. Our history walk took us to Northdale. Our walks are always of general as well as historic interest and this year we had nine participants, ably supported by two volunteer National Park Rangers and the weather was fine! Some of our most beautiful scenery lies in Northdale and although not in the area relating to the ironstone mining and railway activity to any great degree, it still holds some interesting and important sites and makes for a varied and, in some parts strenuous, walk. The feedback from the walkers was very positive and we all enjoyed the two and a half hour ramble around Northdale. Huge thanks to the Rangers, John and David and Jay Marrison of North York Moors National Park for all their help and to Ian Thompson, not forgetting Kate of Gillies Jones Glass who is the brains behind the whole festival! see details of earlier walks below. DISPLAYS – Permanent Photographic Display at The White Horse, Rosedale Abbey – We have the use of a large room to display archive photographs and information. Many of the photographs have been loaned by Beck Isle Museum, Pickering, and a grant was obtained for framing. We use the history room for occasional talks and discussion. We also have our display board in the church. We are most grateful for all the help we have been given to enable us to have these permanent displays for visitors to enjoy. Graze on the Green cafe in the village have some archive photographs in the tea room, which we loaned to the previous owners. Many thanks to Graham and Catherine! 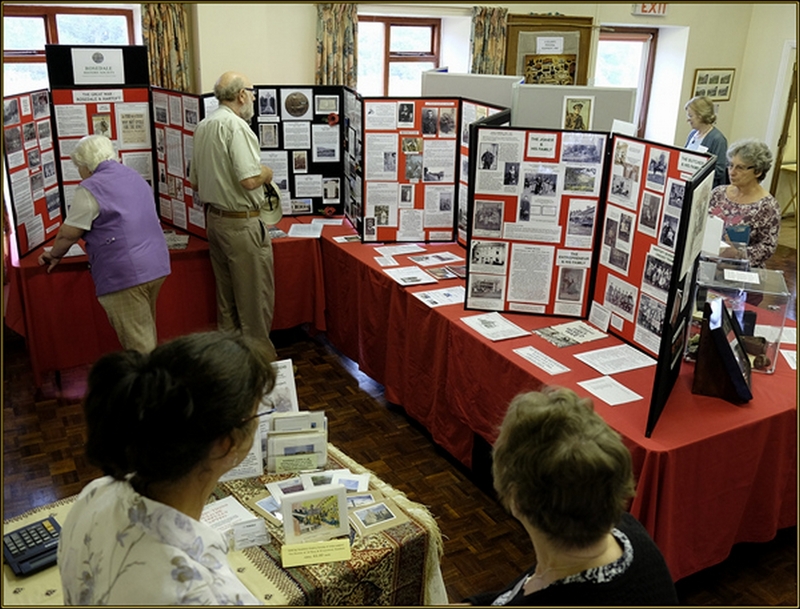 ROSEDALE & HARTOFT TREASURED TEXTILES EXHIBITION took place on the 25 and 26 August. A great success with about 100 items displayed and an amazing variety of antique, old and new hand-made pieces of extraordinary quality. We had very good feedback from visitors from outside Rosedale and our local residents enjoyed putting on a wonderful display of family “treasures”. This was not a history society event but was supported and partly organised by the history society as a community project. Reports on history walks and a kind comment from some of our very supportive members………..
ROSEDALE ABBEY VILLAGE HISTORY WALK starting on Village Green. A small group of us, several from different parts of the country and one or two more locally based, walked around the village and took in the various sites while being given some historical information and shown archive photographs of the people, buildings and sites from the archive. We managed to survive a cold day and our visitors enjoyed the opportunity to learn a little more about Rosedale Abbey. A group of 12 enjoyed a beautiful, warm, sunny afternoon walk to Hollins and up to Ana (Ainhowe) before moving on to Bank Top and the site of the railway terminus, railway cottages and remains of the calcining kilns. One of our guests was delighted also to find the site of some cottages (now long gone) where a mining ancestor and his family had lived. The family were not aware of a Rosedale connection until recently. A successful walk with some excellent feedback. Sadly, due to a continuous and persistent downpour, our group had to abandon the walk after about 15 minutes of walking. The rain went on for hours, so we made the right decision. We will try and re-schedule this walk as most of the group have requested this. 14 participants set off from School Row in pleasant sunshine, returning four and a half hours later after a good walk in the most wonderful landscape. After a lot of mining history, we walked to Dale Head beyond Reeking Gill to the site of the 1860s navvies’ huts and returned along the Line, enjoying the outstanding views. The state of the track bed is a concern as there appears to have been a lot of rabbit damage. 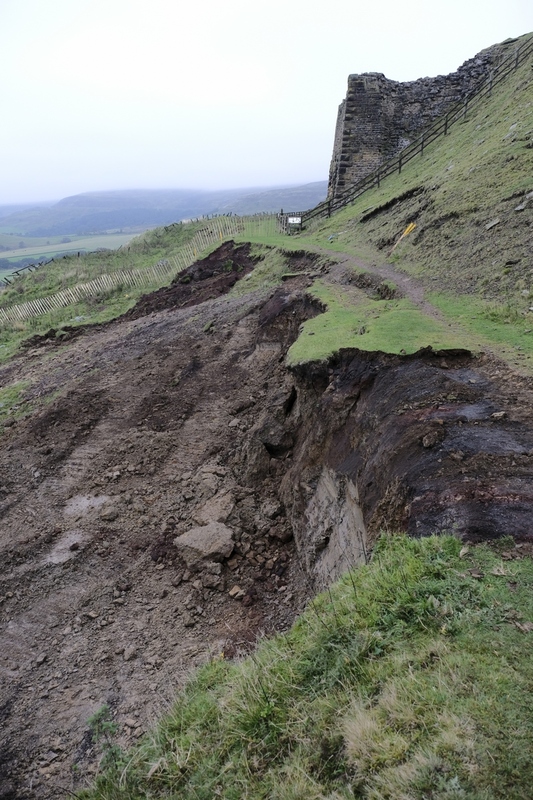 The National Park Authority are aware of the condition of the line and we keep them updated with photographs. We are hopeful that a bid for funding for industrial archaeology will allow us to have an opportunity to protect our walking routes – we cannot afford to lose them. A small group took a stroll around the village in sunshine on what is proving to be a popular short walk. It appeals to visitors who want to know the background to the varied history of this small community and the people who have lived here. It is possible to do this walk at any time of the year (not just the summer months) so please contact me if your group would like to make a booking. THORGILL, MEDD’S FARM & SHERIFF’S PIT, starting and finishing at White Horse car park. Taking in the history of Thorgill, Rosedale West. Who would have thought a small hamlet could provide such a mix of social history? On to Medd’s farm and stables, up the dale side to the Sheriff’s ironstone mine entrances and beyond, to Sheriff’s Pit head. time allowing, a visit to Sledshoe along the old rail track then back along the line to Bank Top, the west end terminus, Hollins incline and calcining kilns. Down Chimney Bank, once the route of the Rosedale Freak Hill climbs. Showing archive photographs en route. We were hit by a bad weather forecast in the morning and come 2.00p.m. only seven of the 13 participants actually turned up! However, undaunted, we set off in the company of our National Park volunteer ranger, Paul Grantham acting as back marker. We had made the decision to shorten the route and not take in the pit head and railway line, due to the very changeable weather. It was cool, very overcast with rainclouds looming over Dale head as we made our way along the road to Thorgill, branching off over the fields beyond Thorgill House, past Rattan Row and into the hamlet. It got a bit windier and we fully expected to be drenched by the time we got to Medd’s. As we stood inside the stables, Sue Atkinson gave us a brief description of the internal layout as it was at the time when the building housed pit ponies in the 19th and very early 20thC. She very kindly made us all a cup of tea while the rain came down! 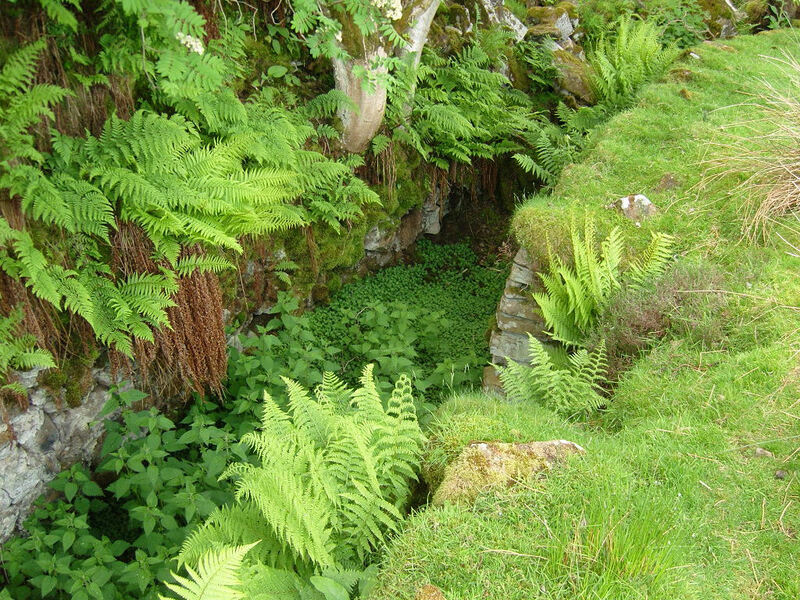 A photograph taken in 2012 showing a mine adit with tramway track on the platform above Medd’s Farm where the main entrance to the Sheriff’s Pit ironstone mine was situated. This area was worked previously for coal. After this welcome break and happily avoiding further rain, we walked up the hillside on very boggy ground which would have been far worse had not the National Park rangers spent time cutting down a lot of vegetation and making a sort of matting which absorbed the worst of the mud. It was quite spectacular, even on a grey day, to stand on the pit platform* taking in the magnificent sweep of the dale, and much to our delight the sun came out and the sky turned blue. The landscape looked incredible and cameras clicked as several of us took the opportunity to capture the scene. Having heard some history of the site and the people who had worked here, the group returned to Thorgill and came back home as the light was fading. We were sad not to have been able to take planned route but everyone seemed to have enjoyed their walk and went away with a free copy of the Rosedale Railway Heritage Guide. We are most grateful to Paul for accompanying us on this walk and to Sue Atkinson at Medd’s for allowing us to shelter during the rain and providing that most welcome cup of tea! 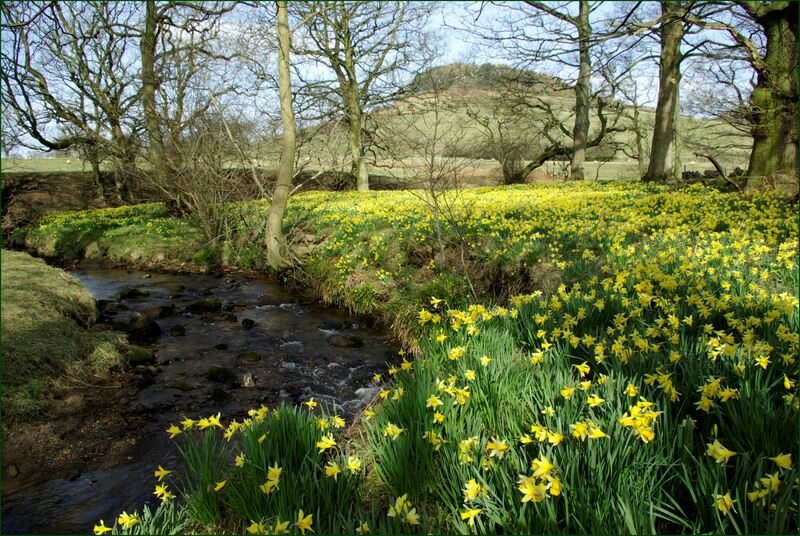 26 April – ROSEDALE HILL CLIMBS, historic road races up and down the infamous Chimney Bank from 1914 -30s. Paul Hayward, local motor historian, gave a talk at The White Horse in a packed History Room. We heard details regarding the races, the vehicles and their intrepid drivers and the evening culminated with a showing of the short clip of archive film of one of the races. Great fun was had by all and we raised over £60 for Paul’s chosen charity, Next Steps, a mental health charity based in Ryedale. We are always grateful to Christine and Jim at The White Horse who, together with their staff, always make the History Society so welcome. HISTORY & ART EVENT 28th and 29th September – following our annual history weekends at this time of year, we decided to combine with the Art Group and put on a photographic exhibition highlighting the last 60 years in Rosedale. We began with a Friday evening reception which was enthusiastically attended by plenty of dale residents. Good wine and cheese were an added attraction and the work by the Art Group made an impressive show. We enjoyed meeting old and new alike during the next day with some excellent feedback and comment. A very enjoyable event. MIDGE HOLE EXCAVATION . 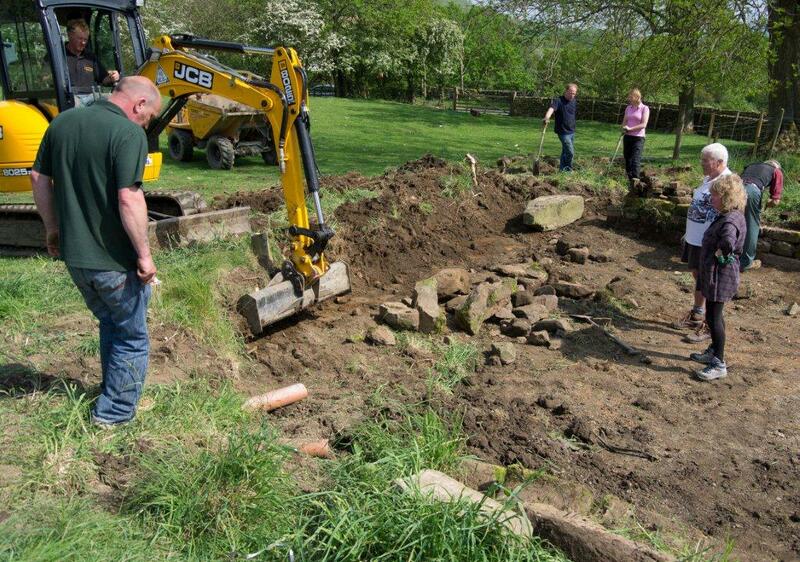 We have been involved with an excavation up at Midge Hole where Paul Metcalfe’s family have lived for many years. A site of an old pond, situated at the roadside, was excavated with the backing of LEADER who provided funding for a professional archaeologist to join us. A warm, dry day meant that Sean Doughty’s digger soon cleared the infill exposing the almost-square, shale-based pond area with retaining stone walls. We spent several hours with the volunteers recording the process with photographs and helping out with a shovel and trowel when required! A local stonemason began work almost immediately on re-setting the dilapidated wall sections and by the of the day, we had a cleared site. 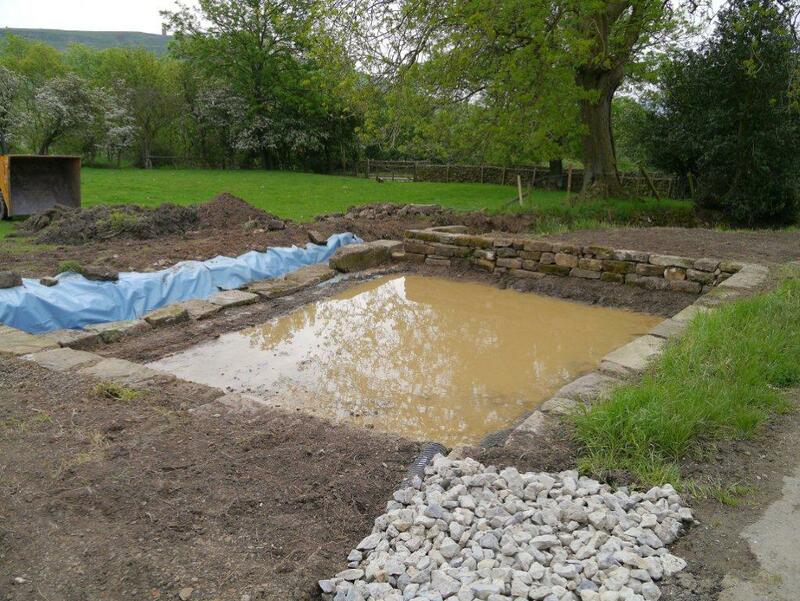 When we went back a week later, Paul had already started work on rebuilding a taller back wall to what is beginning to resemble a tank or water storage set-up rather than the characteristic pond. We await the full written report on the findings and, in the meantime, will make updates of the work as it proceeds. The Metcalfes are to be congratulated on doing a great deal of conservation work round and about Midge Hole and ensuring the pond’s survival for, we hope, another 100 years. UPDATE. 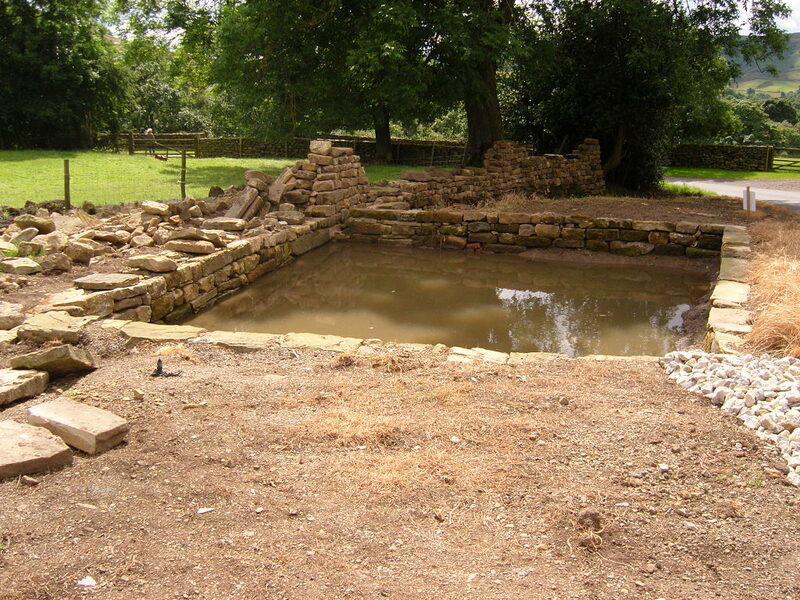 The pond on the 17 July– we visited the pond today and found that the wall at the back of the site is progressing well and that although the water level is down, it is holding. Jackie says that there has been a lot of interest from passers-by and residents and they are looking forward to seeing the work completed when the stonemason has finished shearing. Swallows have been swooping over the pond catching midges! 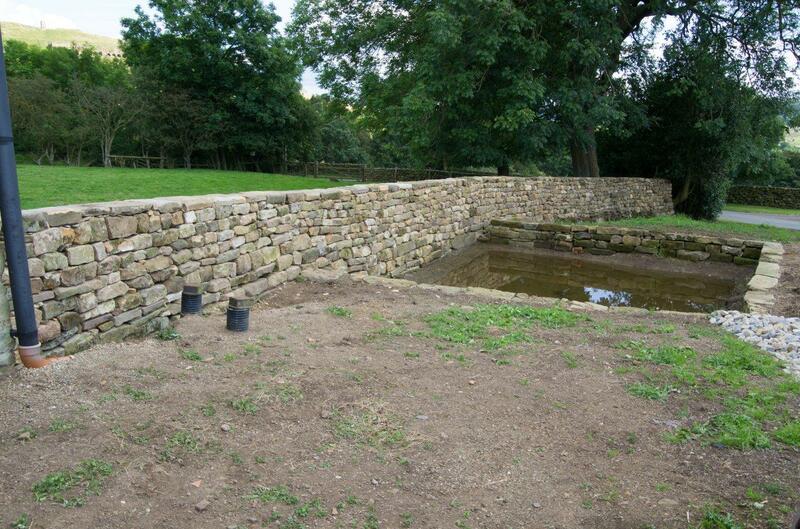 September –the stonework is complete and the next stage is relining the pond. The roadside feature looks very impressive. The archaeologist’s report has arrived and we will continue to look at the progress of the site. In November, the clay arrived and all 10 tons of it, from Alne Brick Works near Easingwold, was used to cover the base. the Metcalfes now have a fully-functioning pond. THE JUBILEE in Rosedale. 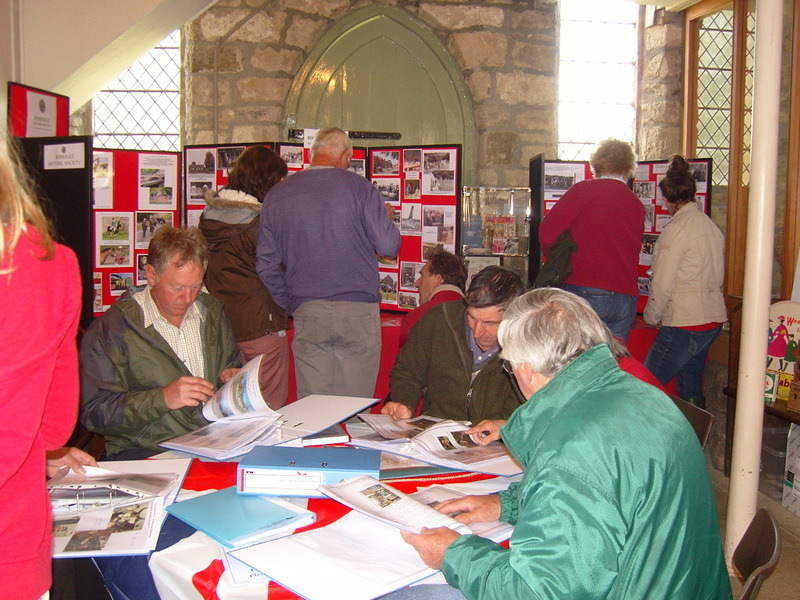 On Monday, 4 JUNE we set up a display of photographs at the back of the church (by kind permission of the Vicar) with access from the Turret Field where the stalls and teas were located. THE SUN SHONE BRIGHTLY! We were incredibly lucky as many thought the rain would spoil the fun. Our project, based on the period covering the last 60 years in Rosedale, has proved very successful and many residents have written about their lives here and the houses they live in. We would like to thank all those who took part and made it such a successful day. 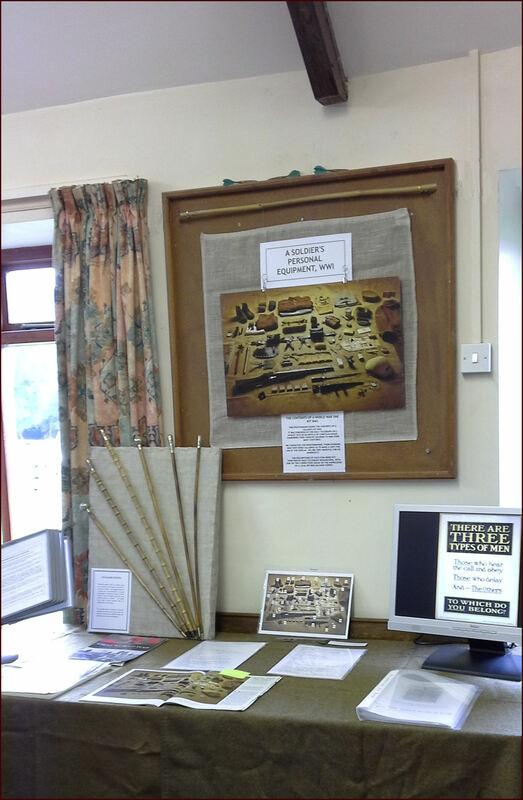 Talk – “An Illustrated History of the Sword” was given by Geoff Sherwin at The White Horse, Chimney Bank, on Tuesday 21 June in our History Room. Guided History Walk –on the 23rd June from Chimney Bank. 27th March 2011 – The 150th Anniversary of the Rosedale Railway. 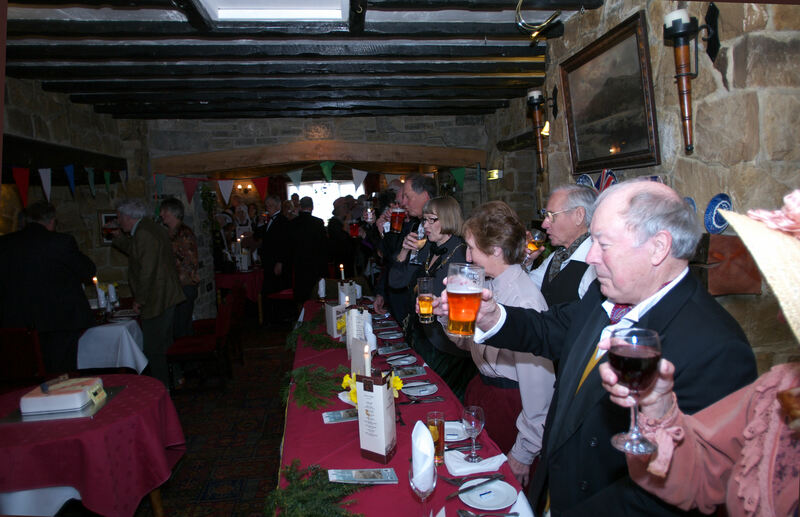 The 150th anniversary celebration of the opening in 1861 of the North Eastern Railway Rosedale Branch line between Bank Top, Rosedale and the Ingleby Incline was held on 27 March 2011.We commemorated this historic event with a Beef Luncheon held at The Lion at Blakey. 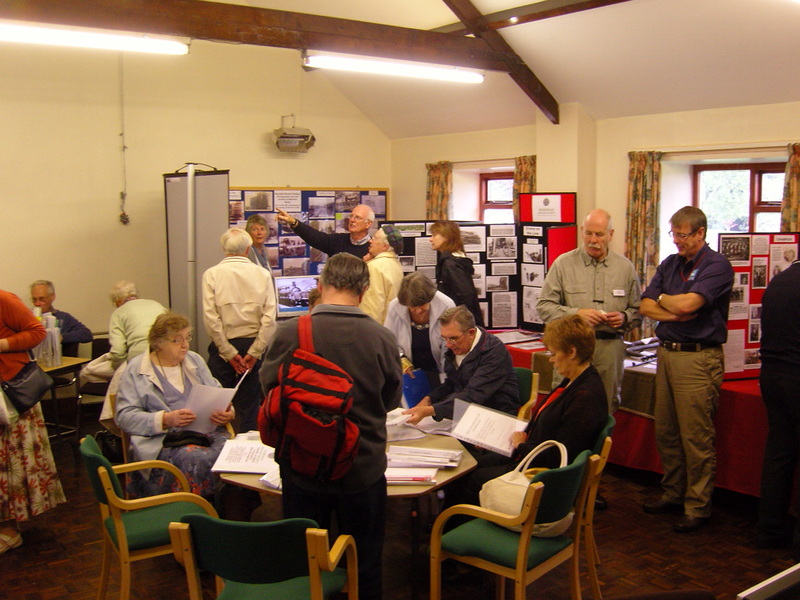 This event was part of a programme, put together by the Kirby, Great Broughton and Ingleby Greenhow History Group and Rosedale History Society, relating to the railway line which was opened in 1861 to carry ironstone from the mines of Rosedale to the great smelting plants of Ferryhill and Consett. 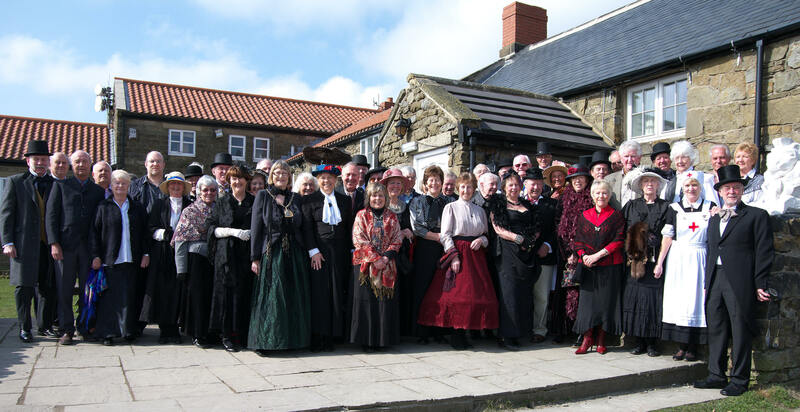 Nearly 70 people from “both ends of the line” met up on a most beautiful day; the sun shining and the views spectacular, with many of us dressed in Victorian costume much to the amusement of a packed pub. We decorated a large room and entered into the spirit of the occasion with speeches, toasts and an exchange of gifts. 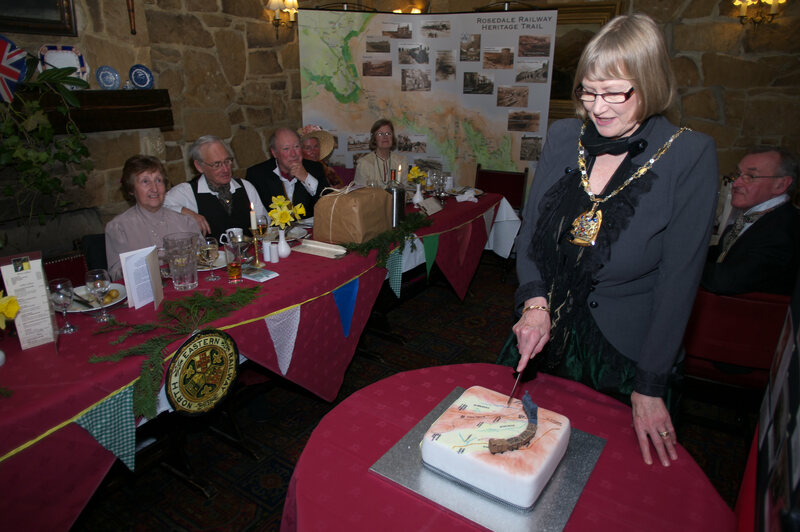 A beautiful, railway-themed cake was ceremoniously sliced by Caroline Seymour, Chairman of the North Riding County Council, and the new Rosedale Railway Heritage Trail Guide was launched. The lunch itself was very enjoyable and we’ve received some excellent feedback confirming that “a grand day” was had by all and it will be remembered as a very happy occasion. The project continues with a travelling display to schools, village halls etc. Please contact us if you would like to arrange a to see it locally. 1851 Census Project – our joint project with Lockton & Levisham and Appleton le Moors history groups has produced a printed booklet giving an insight into our communities at the time of the 1851 Census. This has been a social as well as research-based project and has given us all an opportunity to contrast and compare our moorland communities 160 years ago. We have enjoyed the experience so much that we plan to consider our next joint project soon. The Yorkshire Museum of Farming at Murton near York kindly allowed us access to their archives for this project.